Ginkgo Biloba Gold features a pure, organic Ginkgo leaf extract standardized to 28.8 mg ginkgoflavonglycosides, 7.2 mg terpene lactones, and guaranteed to contain less than 5 parts per million of ginkgolic acid, a naturally-occuring phytocompound that can be toxic in high doses. Ginkgo Biloba Gold is manufactured in the USA to industry-defining quality standards and is verified by independent third-party labs to meet identity, purity, and potency label claims. Ginkgo biloba is one of the oldest living tree species and is thought to have existed for more than 200 million years. Native to China, the leaves of the Ginkgo tree are among the most extensively studied botanicals in use today. The two major active ingredients in Ginkgo Biloba Gold™ are ginkgoflavonglycosides and terpene lactones, both of which are thought to possess potent antioxidant properties. Antioxidants are substances that scavenge free radicals, which occur naturally in the body and grow in number as we age. But environmental toxins (including ultraviolet light, radiation, cigarette smoking, and air pollution) can also increase the number of free radicals, and these free radicals are believed to contribute to health problems affecting the heart as well as overall cognitive function. Antioxidants such as those found in Ginkgo may help neutralize free radicals and support healthy brain function (especially among older adults), healthy circulation, and aging. 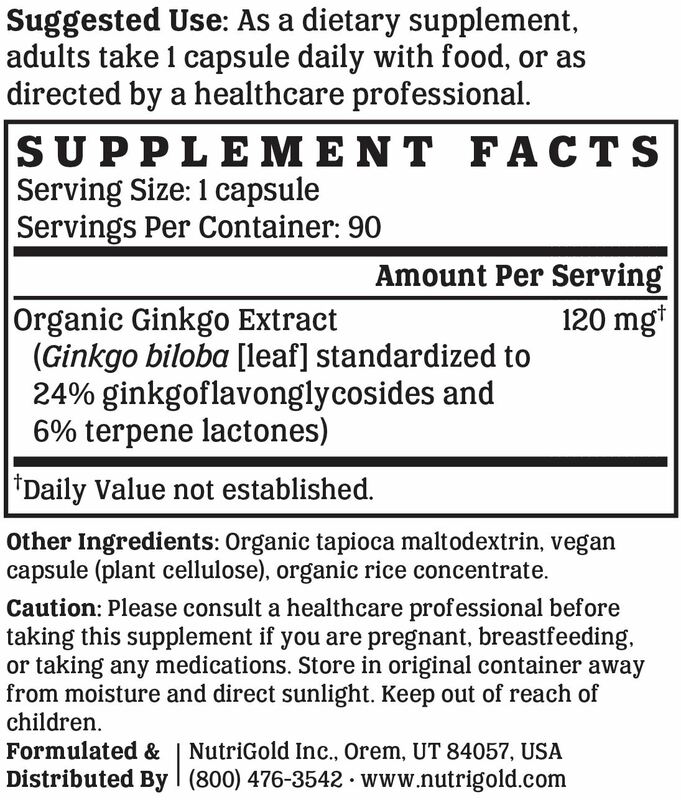 Most commercially available Ginkgo supplements are standardized to 24% ginkgoflavonglycosides and 6% terpene lactones and should be guaranteed to contain less than 5 ppm ginkgolic acid, which is found naturally in Ginkgo and can be toxic if consumed in high doses. Ginkgo Biloba Gold is Non-GMO Project Verified, which provides assurance that the product has been manufactured in accordance with the best practices for GMO avoidance. The Non-GMO Project is North America's premier verification program. Ginkgo Biloba Gold is certified organic by SCS Global Services. An official partner of the USDA, SCS Global Services certifies products that contain between 70% and 95% organic ingredients. Vegan Action has offered vegan certification since 1995. Their official seal is proof that Ginkgo Biloba Gold does not contain ingredients derived from animals or animal by-products, is free of animal-derived GMOs or genes, and is not the subject of ongoing animal testing. Most consumers consider kosher products to be cleaner, healthier, or better than non-kosher products. The Ko Kosher symbol on Ginkgo Biloba Gold is assurance of our brand's unwavering and uncompromising commitment to accountability, quality, and overall safety. We like to make supplements that can be enjoyed by everyone. That's why our products are always compliant with the best practices for avoiding allergens and minimizing cross-contamination. Ginkgo Biloba Gold is free of soy, gluten, egg, milk, peanut, shellfish, and corn allergens. Consistent with our guiding principle to “do no harm,” Ginkgo Biloba Gold is manufactured without the use of additives or preservatives. It contains absolutely NO contaminants, pesticides, herbicides, harmful additives, residual solvents, magnesium stearate, or hexanes. Like all NutriGold products, Ginkgo Biloba Gold is subject to over 140 purity and potency assays by independent, third-party labs to ensure that the product meets or exceeds its claims. So, you can be certain that what's on the label is what's in the bottle. Nothing more, nothing less. No articles featuring Ginkgo Biloba Gold have been published yet.